This is a “live tropical coverage” that started from November 7 and ended on November 10. Arabian sea warms up again!! Fresh flooding rainfall in Oman!! Deep depression ARB 03 is the forth tropical depression from the north Indian ocean for the current year, while the third tropical system from the Arabian sea. There had been four tropical depression in the Bay of Bengal, with one tropical storm according to Joint Typhoon Warning Centre (JTWC). There had been three tropical depression in the Arabian sea with all three intensifying into a tropical storm according to JTWC. According to Pakistan Weather Portal (PWP) on October 29 forecasted about possible formation of a low pressure near Kerala coast during the end of first week of November and move towards the central Arabian sea and intensify further. As of November 7, everything has happened on time with no major change. The storm is expected to move towards southern Oman and adjoining Yemen, a similar track when compared with Keila. The tropical depression might further intensify on both IMD and JTWC as conditions are favourable (happened on November 8 ) but once the storm nears Oman it will start to lose its intensity due to cold waters left by cyclone Keila and western disturbance 07 that is approaching the upper and central parts of Pakistan, once the tropical depression nears the Omani coastline it will started to weaken due to unfavourable conditions. Clouds from ARB 03 covers whole Pakistan on November 10! On November 2, a low pressure area formed near Kerala and adjoining south-eastern Sindh. On November 3, the low pressure system slightly intensified as pressure dropped from 1008 mbar to 1006 mbar over the south-eastern Sindh and adjoining east central Arabian sea, the other day it intensified into a well-marked low pressure as spiral banding started to develop. On November 6, the convection and upper – level conditions improved as vertical wind shear decreased and the pressure further dropped from 1006 mbar to 1004 mbar with depression ARB 03 forming in the central parts of the Arabian sea. On November 7, it further showed signs of intensification as pressure dropped to 1002 mbar. On November 8, the depression intensified into a deep depression as pressure dropped to 1000 mbar and was forecasted to intensify further but a change in the track caused the system to weaken on November 9. On November 10, it weakened into a well-marked low pressure as vertical wind shear increased and system moved over cold waters, the system moved in a Northly direction and PWP forecasted that it move weaken further and move in a W/WSW direction by tomorrow afternoon and on November 11, its dissipating remnants were over near the Omani coast. What happens now? Today’s depression ARB 03 has weakened as per PWP’s forecast into a well-marked low pressure during this evening. Low ARB 03 is heavily sheared, moving in a complete northly direction at the moment. Its remnants may start to move in a W/WSW direction by tomorrow afternoon before finally dissipating, cloud cover will also start to reduce from tomorrow afternoon. It is not significant now! The trough of ARB 03 is extending towards the upper parts of Pakistan, clouds from ARB 03 have covered whole Pakistan including Afghanistan’s Kabul and Kashmir’s Srinagar, also WD 07 is over the extreme northern areas of Pakistan and Kashmir. Since the system is still over water most heavy downpour has stayed away from Oman, decrease is expected in the overall coverage of rain in Oman from tomorrow afternoon. Due to moisture incursion, there are chances of isolated light showers in coastal Pakistan on November 10. Al – Amrat got 3 mm. The trough of this weather system is seen extending well into Sindh to Rajasthan, well-developed spiral bands can be seen south of the system. High level clouds due to moisture incursion from ARB 03 is covering Karachi and many parts of Sindh and eastern and coastal Balochistan coast, few parts south Punjab and adjoining Rajasthan, while there is a thundercloud extreme south of Karachi coast that will weaken by the time if it reaches the country’s coastline, under this influence, light showers are expected around the isolated places of Pakistani coast. While heavy thundershowers with strong winds expected in southern Oman including Masirah. Heavy downpours with strong winds (gusty to 45 mph) likely in southern Oman from today till 2 to 3 days. 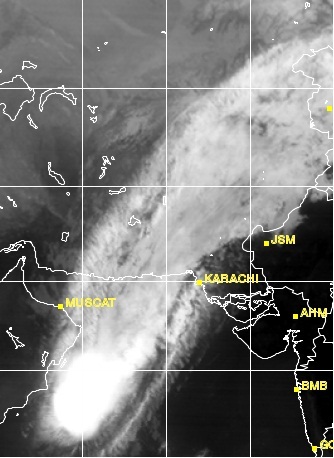 Cloudy weather with chances of light showers expected in Makran coast from tonight while drizzle in Sindh coast. Due to this weather system, fresh flooding rainfall is expected along the southern Omani coastline including Masirah with strong winds from mostly November 8 late till 2 to 3 days. Due to moisture incursion and outer bands of this system, cloudy weather with chances of isolated light showers expected along the Pakistani coastline from November 9 mostly along the Makran coast. Chance of drizzle might occur along the Sindh coast. Pakistan Weather Portal (PWP) wants to know your forecast? ← Pakistan Weather Portal (PWP) – Eid ul Adha Mubarak! any chance to intensify into cat 1? @ K.M, ARB all Depressions either gives rains to Arabian countries or Indian Provinces. Will ARB any depression ever give meaningful rains to karachi?